Oakland Encourages every individual and family to establish and work a monthly budget to avoid debt, build savings, and insure generosity. A simple budgeting form is available here. If you have set a budget and decided to support the Kingdom of God at Oakland Presbyterian Church, then you might find it helpful to set up online, reoccurring payments through your bank. Why Set Up Online Automatic Contributions? Using online automatic contributions is one way to simplify your church giving (and all other charitable donations and bill-payments, too). By setting up this automatic reoccurring payments, you will not have to remember you check book or adequate cash on Sunday mornings or handwrite checks every time you give. Instead you can choose an amount and date(s), and your bank will regularly write those checks on your behalf. For many of us, this helps us remember to write the checks we want to write but often forget or can’t because we forgot our checkbook. 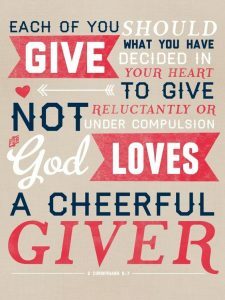 For others, online automatic giving is a way to give God our first fruits at payday rather than our leftovers a few days/weeks later. How Do I Set Up These Automatic Payments? The easiest way for most people will be to sign into your bank’s online banking website, but if you are uncomfortable banking online, you may call your local branch to make the same arrangements. Most every bank offers online bill pay. This allows account holders to send money from their checking or savings accounts to whomever they want, at whatever frequency they want. Some banks physically print checks and mail them to your creditors, while others will transfer money electronically. You can set up your automatic payments by logging in to your bank's bill pay website, setting up a new payee, and entering the account number of the creditor or utility you want to pay in the appropriate fields. Most banks allow you to set up recurring payment frequencies and specific dates so that the checks are written when you know the funds will be available. You could choose to give your tithe on the 1st of every month, or write a check every two weeks to correspond with your pay periods – however works for you. You can also set up reminders to notify you when a payment is being prepared, sent, or cashed. Here are links to specific banks’ Bill Pay websites, FAQs, and Tutorials (this is in no way an endorsement for any of these banks). If you have any questions please contact the Treasurer at Oakland Presbyterian Church.